Both Sun Basket and Plated provide their users with extraordinary cooking experiences, combining nutrition with amazing flavors and creative recipes. Our Sun Basket vs. Plated comparison can help you choose between the two meal kit delivery services by outlining all the important features of each company. In this guide, you will find all the info you will ever need about both Sun Basket and Plated, allowing you to easily make your final decision. Sun Basket offers 2 weekly menus, Classic and Family. With the Classic menu, you can choose between the Vegan, Vegetarian, Pescatarian, Mediterranean, Paleo, Gluten-Free, Lean & Clean, Quick & Easy, Diabetes-Friendly, Carb-Conscious, and Chef’s Choice meal plans. The Family menu allows you to opt for the Chef’s Choice plan or the Vegetarian plan. Plated does not offer special meal plans, but its menus do feature meals for vegetarians, as well as for meat and seafood lovers. They also offer desserts. Both companies invest a great deal of effort into coming up with new recipes every week. Sun Basket’s weekly offer includes 18 delicious, chef-curated dinner recipes on the Classic menu and 6 kid-friendly dinner recipes on the Family menu. Apart from meals, the service offers add-ons, including 5-minute salads, dips, sauces, and vegetable snacks. Plated’s weekly menu features 20 wonderful dinner recipes and 2 dessert ideas. All Sun Basket recipes are nutritionist-approved and contain all the valuable nutrients your body needs. Plated does not fall behind and offers balanced, nutritious meals that keep your body in good shape. The amount of ingredients you receive from both companies is carefully calculated and based on the rules of healthy eating. It is more than enough to keep you feeling full and energized throughout the day. Sun Basket and Plated are among the most flexible meal deliveries on the market. Both companies allow you to skip a delivery or cancel at any time, as long as you notify them in advance. The prices of meals at Sun Basket and Plated are pretty similar, with Plated meals being only slightly more affordable. With Plated, you get a 50% discount on your first order. As far as shipping is concerned, Plated offers free shipping on all orders over $60. 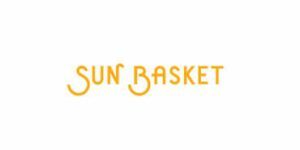 Sun Basket offers free shipping on your first order only. All subsequent orders come with a $6.99 shipping fee. However, Sun Basket does give you a full refund in case you are not happy with your delivery.